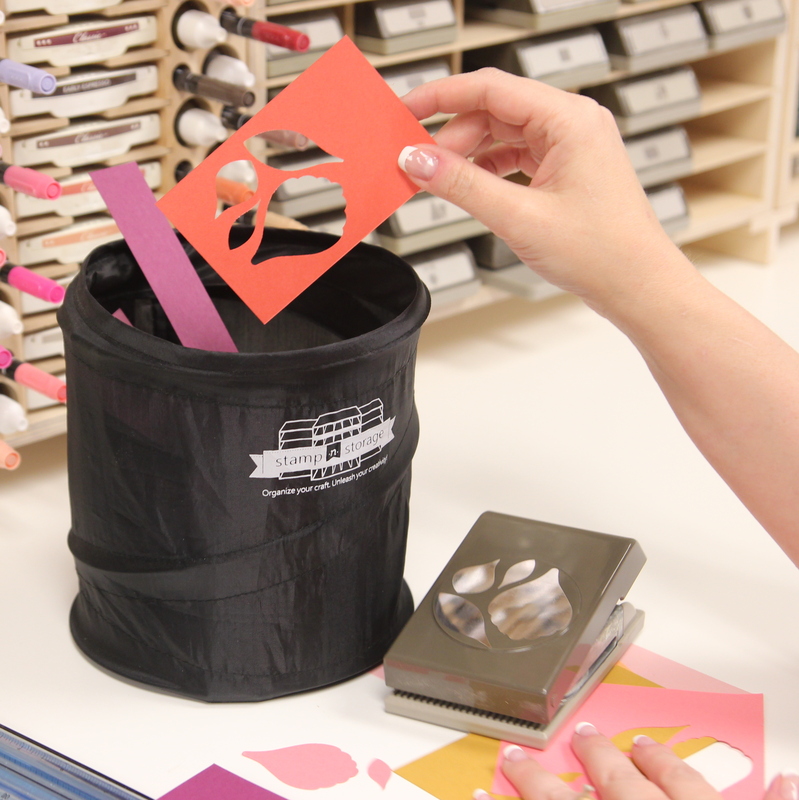 Let the Stamp-n-Storage Kickstand take your craft storage to a whole new level! We know that every square inch of your desktop space is precious to you. That's why the Kickstand is such a great addition to any craft room. Place your cabinets on top of the Kickstand and your work surface will grow nearly 5" deeper. 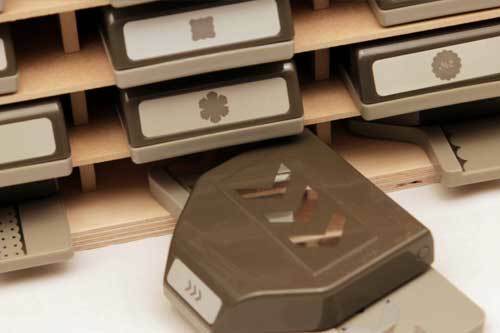 They lift your Stamp-n-Storage cabinets off the desktop by 1-1/2". You'll have plenty of room to slip your trimmer, your project, or other items right underneath. Kickstand Corner: Place these at the end of each row of Stamp-n-Storage cabinets. Kickstand Tee: Put one of these in between two neighboring Stamp-n-Storage cabinets. If you have Stamp-n-Storage cabinets on two separate counters or an L-shaped counter-top, you would count each section separately. In the case of an L-shaped counter-top, the minimum you need is 4Kickstand Corners. Most Stamp-n-Storage cabinets are strong enough to be supported with only two Kickstand Corners at the ends. We recommend using one Kickstand Tee in the middle of the large Lock-Down Punch Holder due to its size and weight when it’s fully loaded with supplies. If you stack the Stamp-n-Storage cabinets, put the widest pieces on the bottom so you'll need as few Kickstands as possible. This will ensure your work surface has the least obstructions possible. For example, if your Marker Holders are on the bottom, you'll need a lot more Kickstand Tees and the spaces will be very narrow. These little things are so great to give you a little extra space to store things. I use every inch of space I can and having a few things that I reach for quite often slid under my ink storage makes things quite handy! You could search high and wide and never find better craftsmanship than right here! This particular product is no exception. I now have a bit of storage room under my ink storage..units .and who doesn't need more storage even if it's small. My paper trimmer fits nicely under one of my ink units. So nice to get the trimmer out of my way when I'm not using it. Love these as they free up the “real estate” on my craft table. Love the kickstands. I know it seems like not much, but that little extra space on my desk is awesome. Thank you!!! I love the spaces created by the kick stands for cutters ... makes everything so accessible and convenient! I really like the Kickstand items. Not only do they stabilize raise up storage items making easy access to the bottom layer of container items, the new found under spaces allow for versatile spaces for desk/table top storage. Sturdy and make extra space. This was my second purchase of the Kickstand. I love how it gives me just a bit of extra space that was not there. 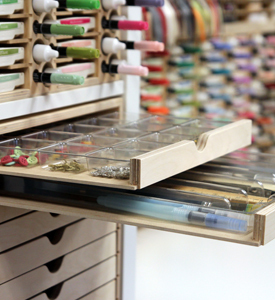 I can store extra stamp pads, embellishments, and other tools that I need at my fingertips...... Thanks so much for your creativity and design work! Great products! Worked wonderful to raise the stamp pad/pen storage unit and the punch storage unit up enough to slide my stampin trimmer and stamp pad cleaner underneath. This made me very happy!! Love all my products I've ordered so far. 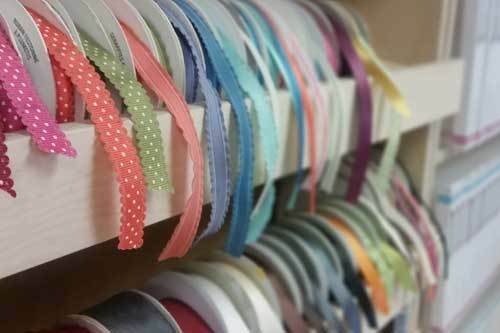 It is such a simple way to create hidden space in a craft area. They are so simple and yet do such a great job. Highly recommend! I never knew I needed these little guys until I put my new storage on my desk. I love they allow me to stick stuff I use every day underneath. I have purchased a few products from this company and they are fantastic quality. I suggest the kick stands for anything you will be putting on desk or counter. Everything is packaged well (although last box UPS managed to mangle, nothing my husband couldn't fix) and their customer service is excellent. Highly recommend this company. When I first saw these things in the catalog I thought what the heck? How will these little tidbits hold up all that weight?? Well, they DO and it gives me some nice room under my units for storing stamp cleaner pads and other little things that always get in the way when they're not being used. Definitely worth the money!! This added about 1.5 inches to my desktop; I can slide anything I want under the ink pad holder I bought. Genius! Very nice product and flawless craftsmanship. I would highly suggest ordering this product. I ordered two corner and three tee stands and let me just say WOW. I have these holding up 3 maker nooks and a custom slim ink pad holder. It has made so much more room on my desk. I can keep a few things out now but not in the way. I even made a little box for the empty space so I can keep my most used stamp blocks under there with out the getting lost to the back. Defiantly plan to get more if my storage expands. This little this make a big difference on my desk. I love it and recommend for everyone who purchase any of the combos or the punch shelf. High five!!! I really love how these give me plenty of space to store my stamp scrubber, paper trimmer and other things. So glad my friend recommended this product to me. Helps make use of all the desk top space! I really like how these give me plenty of space to store my stamp scrubber, paper trimmer and works in progress on my desk to just reach for them. A tiny little thing but makes a big difference. I love being able to hide some things under my nice shelf. Looks better than if they were just lying around. amazing how these little kickstands add so much space. I wasn't sure I needed to order these kickstands, but I'm glad I did! The extra space it gives me under my combo holder and punch holder is truly useful and keeps everything looking neat and tidy. I keep my trimmer, envelope maker and Misti there. Very convenient--close at hand, but out of the way. Thank you for thinking about all of the details in your products! I now have extra space on my desk to put my Stampin Up cleaning pads, scoring boards, etc... gets everything out of drawers. I had debated ordering Kickstands in the past, but finally decided to see if that extra bit of surface storage would really make much of a difference. I ordered corners and tees, even though technically I didn't need tees. I'm so glad I got both! Great quality, as usual. I have a 120 slot ink pad holder and a 60 slot ink pad and reinker holder. After using a corner on either end, I put a tee in the middle of each. I like how it compartmentalizes the space under my ink holders to help keep what I place under there in its place. My Misti and mini Scor-Pal are both moved out of my main working area when not in use. 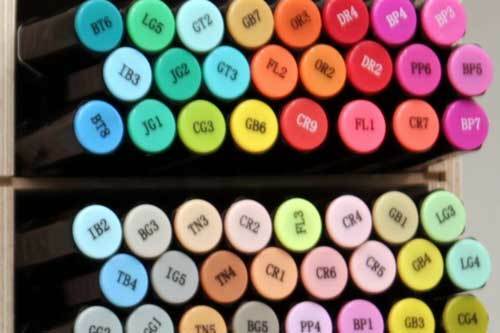 I also store scratch paper, sponge daubers and "marshmallows" under my ink holders. The Kickstands may not have been a necessity, but they make my work surface more neat and functional. Great little lifters those Kickstands! Wonderful for adding storage to my workspace! I recently purchased Stamp-n-Storage products. The shipping was super fast, and everything has been very well made. LOVE THEM! They are beautiful and have simplified my stamping process, making stamping even more fun. I stacked the Combo and Punch holders on my workspace and then put the kickstands under this stack. The kickstands did allow extra storage space and the whole stack is surprisingly sturdy. When I went to put felt on the bottom of the kickstands, so they wouldn't scratch my table, I was surprised - yup - Stamp-n-Storage had already added the felt! I smile every time I look at my reorganized stamping space! It's amazing how such a little piece of wood can make such a difference! 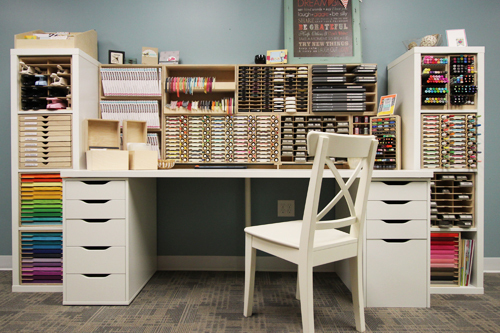 With my storage racks raised on the kickstands, I can keep my Stampin' Scrub, Stampin' Pierce mat, and punchboards all easily accessible on my desktop without wasting valuable stamping space. If you're buying desktop items, I strongly suggest that you add these to your order. You'll love the extra space! This is the second set of kick stands & tees I have purchased and am quite pleased. 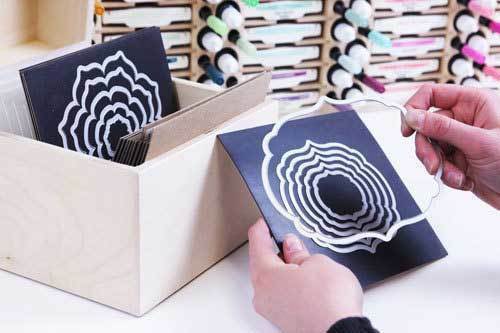 I use one set for my 2 stamp pad storage systems and the other for a non-StampNStorage system. ALL the products purchased over the past years are in excellent condition and I am plotting my next purchase! Kickstands are a great addition to my new 36 ink pads & refills unit. It allows me to store my Misti and plastic box of sponge daubers underneath thereby creating and being able to utilize this space. 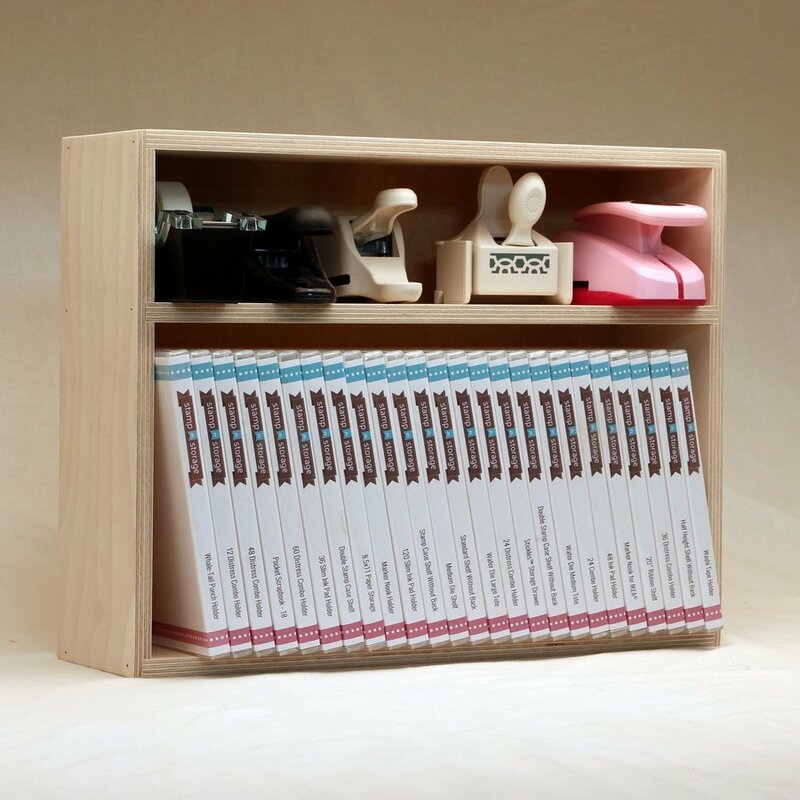 Terrific idea that raises the Stamp Case Shelves, and all the other desk top holders. The Kick Stands allow papers and your mats to fit under, giviing you back that lost space. Great product and heavy duty that gives me space under my storage shelves for other items. I love the couple inches more of space it gives me to store things to have right at my fingertips. I keep my Misti, my paper cutter, and some other small things I need handy. Brilliant idea! These little things are so awesome! The perfect way to get a little more use out of some extra space. Love it! Kickstands are so awesome! 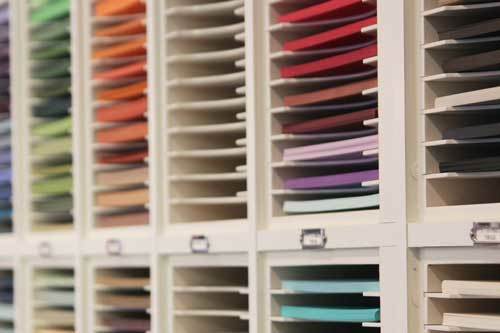 A great way to add lift to your storage and create a little more storage room. Genius! This little bit of extra space really helps with storage for a tiny craft area. Love it! Just raising the units on my desk, I have a lot more space for place things I always use but never seem to put away. My paper trimmer, stamp cleaner, MISTI, TV remote, in process projects.....I can tuck them away and still have easy access. I love these things. Who knew? What a great idea I can add more storage area with this addition beautifully crafted and sturdy. definitely get it! Added to my order as an afterthought...but so glad I did. I appreciate the extra bit of storage space for those small miscellaneous items. A great finishing touch! Great way to add a lift to your storage! These little pieces are just awesome! I love making use of every bit of space I can and these little lifters give me just a little bit more storage space to push those flat things off of my desk when not in use! Incredible idea! these are a wonderful support to the ink holders. they are very sturdy and easy to install. Really like being able to raise my ink pad holder and have more spaces to store more small items underneath. I love this idea of lifting the storage items. I used it so I could put my small boxes of Stampin spots under my stamp holder!!! It works perfect. Wish they were a little lower in price. But overall a great product!!! 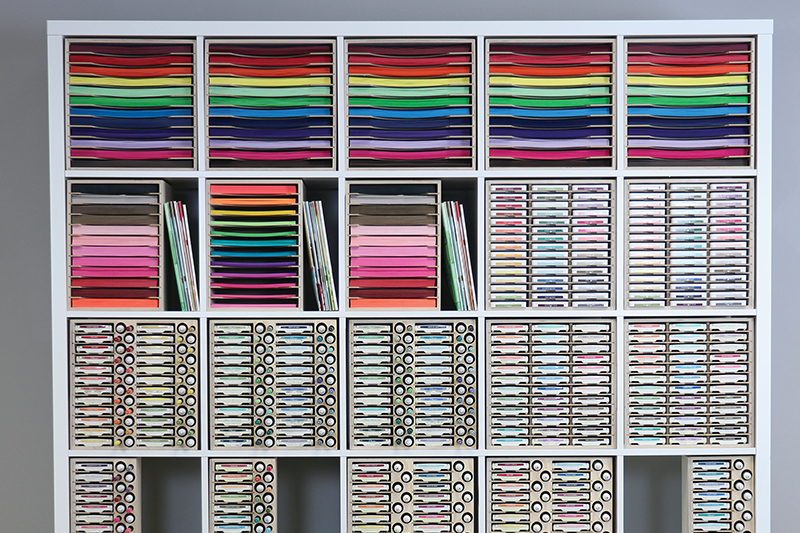 What an organizer! Just what I need! Just finished putting all my pads, re-inkers and colored pens in mine tonight and it looks great. So handy and so neat! I'm lovin' it! Super simple idea, that gives my paper cutter a home close by, and room for other stuff. THANKS!! I really do love the kickstands and I can't believe how much more I can have at my fingertips now. My only recommendation is a design to use with the corner shelf. The two on the side weren't enough so I ended up sliding a regular one in the back but think a v shaped one would be better. Why I didn't get these before? These fit perfectly under my large combo holder. Wonder choice. It is amazing what two little wood pieces can do! I can now slide my trimmer, phone book/glue pad, and Stampin' Scrub underneath my ink pad combo holder and all three things are off the work area of my desk. I love that! These kickstands also make it so easy to remove the bottom row ink pads in the combo holder. Ingenious and simple solution at a very inexpensive price = very happy stamper (and customer)! I love, love having the extra space under my Stamp Pad Combo. I now store my paper cutter right ther so everything is very handy. Yeah! This is a must have. I guess I hadn't checked the catalog as carefully as I thought I had. I wasn't aware until this order that such a thing as the kickstand was available. I purchased this for my combo holder as well as for my stamp case shelves. I love them. It's so convenient to be able to tuck my work in progress underneath the combo holder or my trimmer under my stamp case holder. Sometimes I put a card that I'm planning to be my "next project" under there so I can keep it out of the way but not put away yet. Thank you so much for thinking of this option and making it available to use. Love your products. Love that they are Made in America. Amazing company! I purchased 4 corners & 1 T, sure wish I would have ordered one more tee at that time. These are giving me that extra room to store smaller items such as those oversize jumbo ink pads and scoring boards underneath my ink pad holders. I LOVE THE EXTRA SPACE UNDERNEATH MY UNITS!!! Because I have my 60 combo holder on my desktop, the kickstands really help by allowing me to store things underneath. It also allows for easier access to the bottom row of ink pads. My only wish is that it was just a wee bit taller. It was like StampNStorage was listening to the conversation in my head. I had just finished a good cleanup on my space and had my various punch boards and cutters sitting on the floor trying to figure out where to put them. Next thing I know, I am reading about Kickstand. Perfect -- I love it. Storage stays stable and I have a new neat way to store some important tools. Thanks. The Kickstand items are great. Not only is there more room for my hands to retrieve items from the bottom row of some of the products, but it gives additional table/desk space. I love the kickstands! It gives you a little more space for things and makes it so much easier to get things out of the bottom of the units. Love these! So easy now to get my ink pads or punches from the bottom rows without moving everything on my desk. Great idea! Love how I can now store my cutters UNDER my pads and markers while still maintaining easy access! Kickstand: Excellent workmanship and I'll make good use of the extra space. Customer service: Excellent! Puts a "Lift " into my room! Looking forward to lifting up my existing Stamp n storage units to make additional room for storage! Great idea! I like how the kickstand gives me space below my stamp holder to put my paper cutter. so - I didn't really understand what these were, until I went to pick up some other items that I had ordered. When they explained, it sounded brilliant. I bought them, and LOVE the extra space they give me in my little Craft Cave! Hard to believe a simple little thing like this can be so ridiculously brilliant! The extra room that these little kickstands give me is perfect for the long lockdown punches that I usually have to rest on the top. I love it! Works great. Just what I needed. When I called this item was suggested to me and I am very glad that I purchased it. It provided additional storage for more ink pads. It is an item that I'm glad they thought to produce! The kickstand makes your space more efficient! I was skeptical about these so I only ordered 2 kickstands and 1 T. Well, they are GREAT and I've ordered more. They are very sturdy, and gaining space under my shelf is almost like having another whole surface to work on! I bought the kickstand just in case I wanted to lift up my holders....It's ok but right not I'm not utilizing the space under the holders. We'll have to wait and see. I don't know why, but I was stunned at the quality of even the Kickstands! They offer more space than I had anticipated. The felt feet protects my work surface. The sturdiness is better than I was anticipating, too. FABulous! Thank you for these! Gives me easy access to the bottom of my ink pad combo holder! Gives me an inch or so of extra space for smaller items. Absolutely love them. So happy I bought this! I was excited to see these new tools and their potential to give me more work space on my craft table. Now that I have them the reality of the added "real estate" is even more than I had hoped for. 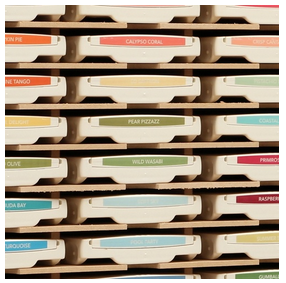 They are a great and inexpensive addition to my storage solutions - including non-Stamp-N-Storage items! Raises my holder up just enough to utilize some extra space on my desk - great idea! Love, love, love the corners and the tee. It has raised it up enough to be able to put things under the holders and keep the table area clear. Great idea! I wanted to store my laptop under the Ink Pad holders that I have and now I can do that. It gives my so much more desk space. Thanks for a great product! I love this product. So nice to utilize more storage space! Why didn't we think of this sooner? 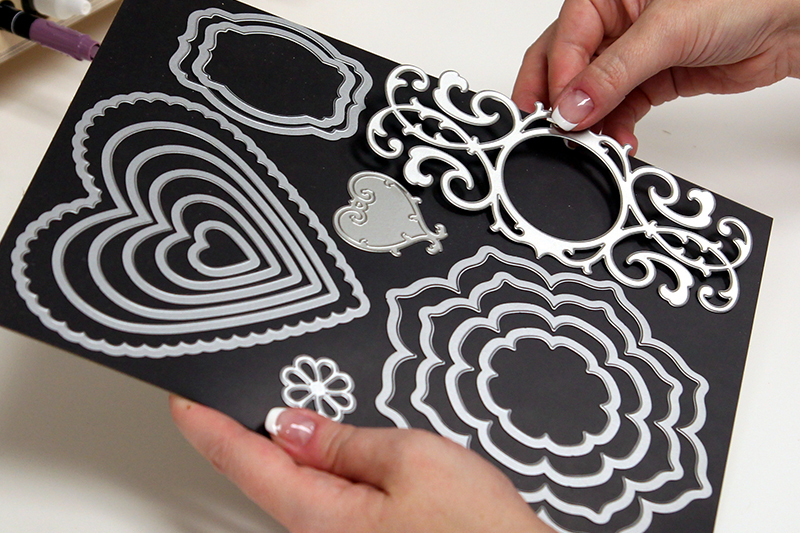 This is such a simple but terrific idea to give you more space in your stamping area. The Kickstand is sturdy and holds my large stamp pad holder with ease. Definitely worth it! Love these little rascals. I keep my Stampin Up catalog and piercing mat under there so far. My Paper Pumpkin box fits under the markers in my combo storage. My craft table is a sheet of plywood, so I don't lose any crafting room if things stick out a bit and I also don't end piling things on top (it would block my ink when I get creative, can't have that! ). I see from remarks below I will look at putting my envelope and box boards there too! what a great idea to be able to reclaim part of your desk top to store small very needed items. the first item was my cutter, then some card stock that is cut 4 x 5 1/4 that i use all the time and them my misty. Like them! Able to get my envelope boards (2) and box making board under my ink storage. Would have liked about 1/4" more height but really helpful! I really like the extra space I gained by using the kick stands under my combo holder. Now I have room for my trimmer, and stamp cleaner pad! Yippee!